Anne Belovich, a resident of western Washington State, has devoted many years of her life and much of her resources to search around the world and assemble one of the world’s greatest collections of once blooming, giant rambling roses. Anne currently has about 350 different varieties of ramblers in her collection. Ramblers were very popular in gardens in America and Europe in the late 1800’s and early 1900’s. Many of the roses existing today were hybridized during this era. Today Rambling roses are more correctly referred by their more botanically correct classifications such as Hybrid Multiflora or Hybrid Wichurana however they are still called “Ramblers” by most rosarians. Ramblers are simply first or second generation, once blooming, crosses of species roses with more modern, larger flowered roses. Many of Anne’s roses are extremely rare and the long term preservation of her collection has become a high priority in her life. Her greatest concern was to make sure her valuable collection would continue to be available for all to enjoy in the future. Dean and Carol Oswald, owners of the Chambersville Tree Farms, are pleased to step forward and construct the Anne Belovich Rambler Garden to provide a permanent home for Anne’s magnificent collection. The garden was designed by noted rose author and lecturer Stephen Scanniello of New Jersey with Claude Graves, curator of the Chambersville rose gardens. The Anne Belovich Rambler Garden is divided into two sub-gardens, the Towers Garden and the Rambler Grove. First is the Towers Garden, which is the formal wedding venue. The Towers Garden contains a central core of re-blooming climbing roses, and re-blooming Tea and China roses around a seating area and stage. The northern perimeter of the garden is a blend of once blooming rambling roses and reblooming shrub roses. All of the ramblers in this garden were created by American hybridizers. Included in the Towers Garden will be a trial bed of heirloom Hybrid Tea roses that were also very popular in American gardens during the peak era of the ramblers. The heirloom Hybrid Tea roses will be planted in 2015. The second garden, the Rambler Grove, consists only of ramblers, all grown individually on twelve foot tall towers. The dominate feature of the Rambler Grove is a 330 foot long 24 food wide Paseo consisting of 48 of the largest ramblers paralleling the edge of the lake. The Paseo provides a spectacular stroll along the lake or a dramatic entrance for a bride in a horse and carriage to the wedding site. 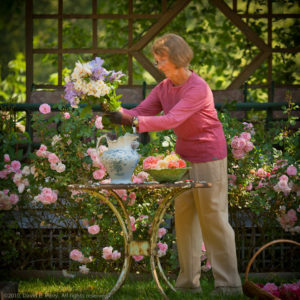 The Anne Belovich Rambler Garden contains 322 roses of which 150 are Ramblers from Anne Belovich’s collection. Additional Ramblers from Anne’s collection will be added gradually over the next few years. We wish to thank Dr. Malcolm Manners of Florida Southern College for his and the colleges support by rooting the cuttings from Anne’s garden and sending them on to Chambersville.